, one of the greatest theoretic musicians of modern times, was born at Berlin about 1667, and became so early a proficient on the harpsichord, that at the age of fourteen he was sent for to court, and appointed to teach the prince, father of the great Frederic king of Prussia, About 1700, he came over to England, and was retained as a performer at Drurylane, and it is supposed that he assisted in composing the | operas which were performed there. In 1707 he had acquired English sufficient to adapt ]\iouea,ux’s translation of the Italian opera of “Thomyris” to airs of Scarlatti and Boiioncini, and to new-set the recitatives. In 1709 and 1710, several of his works were advertised in the first edition of the Tatlers, particularly a set of sonatas for a flute and bass, and his first book of cantatas. In 1713 he obtained, at the same time as Crofts, the degree of doctor of music at the university of Oxford. 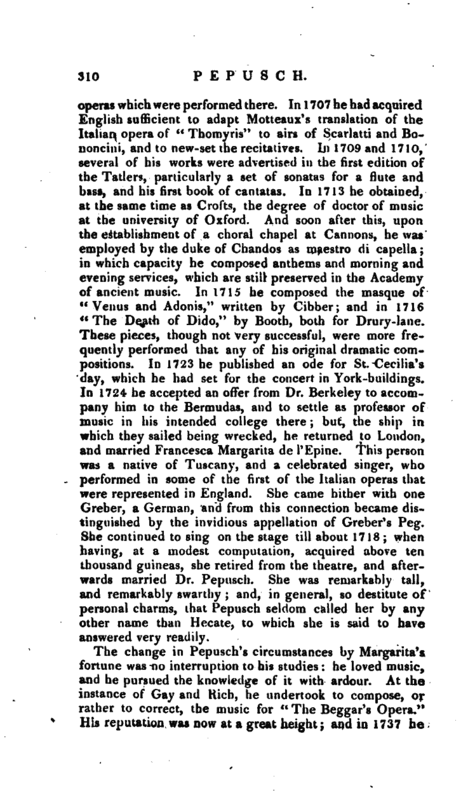 And soon after this, upon, the establishment of a choral chapel at Cannons, he was employed by the duke of Chandos as maestro di capella; in which capacity he composed anthems and morning and evening services, which are still preserved in the Academy of ancient music. In 1715 he composed the masque of “Venus and Adonis,” written by Cibber; and in 1716 “The Death of Dido,” by Booth, both for Drury-lane. These pieces, though not very successful, were more frequently performed that any of his original dramatic compositions. In 1723 he published an ode for St. Cecilia’s day, which he had set for the concert in York-buildings. In 1724 he accepted an offer from Dr. Berkeley to accompany him to the Bermudas, and to settle as professor of music in his intended college there; but, the ship in which they sailed being wrecked, he returned to London, and married Francesca Margarita de l’Epine. This person was a native of Tuscany, and a celebrated singer, who performed in some of the first of the Italian operas that were represented in England. She came hither with one reber, a German, and from this connection became distinguished by the invidious appellation of Greber’s Peg. She continued to sing on the stage till about 1718; when having, at a modest computation, acquired above ten thousand guineas, she retired from the theatre, and afterwards married Dr. Pepusch. She was remarkably tall, and remarkably swarthy; and, in general, so destitute of personal charms, that Pepusch seldom called her by any other name than Hecate, to which she is said to have answered very readily. 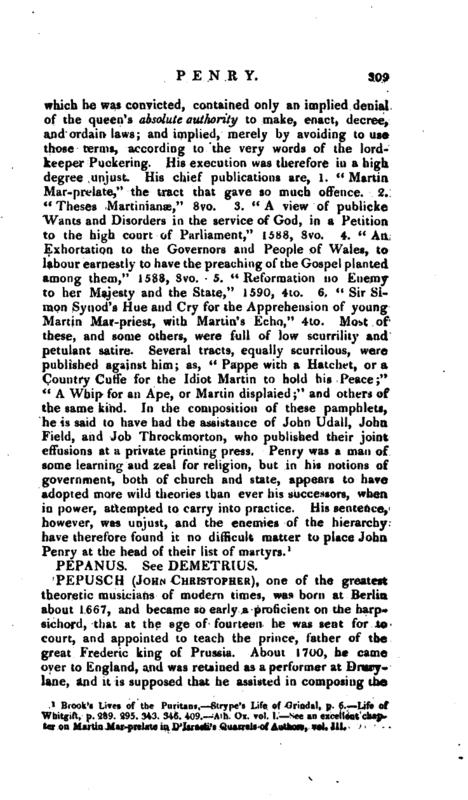 The change in Pepusch’s circumstances by Margarita’s fortune was no interruption to his studies: he loved music, and he pursued the knowledge of it with ardour. At the instance of Gay and Kich, he undertook to compose, or rather to correct, the music for “The Beggar’s Opera.” His reputation was now at a great height; and in 1737 he | was chosen organist of the Charter-house, and retired, with his wife, to that venerable mansion. The wife died in 1740, before which he lost a son, his only child; so that he had no source of delight left, but the prosecution of his studies, and the teaching of a few favourite pupils, v\ho attended him at his apartments. Here he drew up that account of the ancient genera, which was read before the Royal Society, and is published in the “Philosophical Transactions” for Oct. Nov. and. Dec. 174&; and, soon after the publication of that account, he was chosen a fellow of the Royal Society. He died the 20th of July, 1752, aged eighty-five; and was buried in the chapel of the Charter-house, where a tablet with an inscription is placed over him. ­As a practical musician, though so excellent a harmonist, he was possessed of so little invention, that few of his coinpositions were ever in general use and favour, except one of his twelve cantatas, “Alexis,” and his airs for two flutes or violins, consisting of simple easy themes or grounds with variations, each part echoing the other in common divisions for the improvement of the hand. 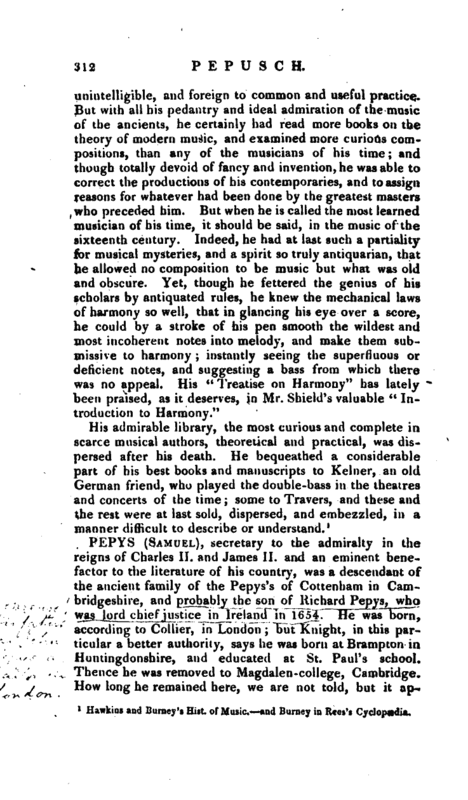 Indeed, though only one cantata of the two books he published was ever much noticed, there is considerable harmonica! merit in them all; the recitatives are in general good, and the counterpoint perfectly correct and masterly. 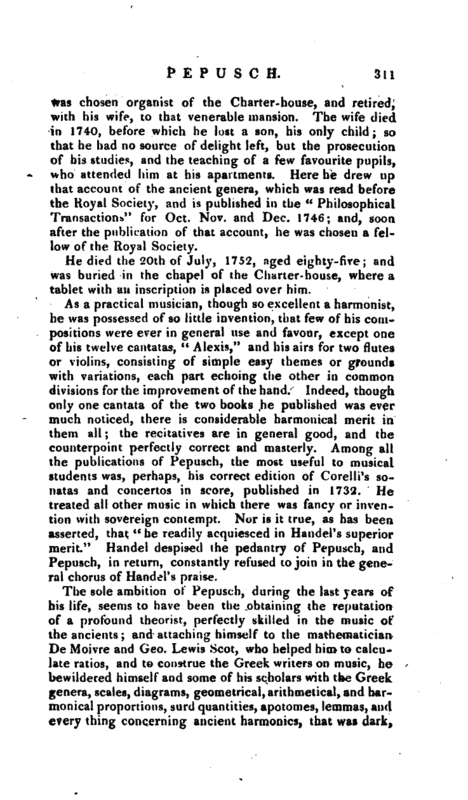 Among all the publications of Pepusch, the most useful to musical students was, perhaps, his correct edition of Corelli’s sonatas and concertos in score, published in 1732. He treated all other music in which there was fancy or invention with sovereign contempt. Nor is it true, as has been asserted, that “he readily acquiesced in Handel’s superior merit.” Handel despised the pedantry of Pepusch, and Pepusch, in return, constantly refused to join in the general chorus of Handel’s praise.